Geoffrey Boycott, the former England batsman, has said while Andrew Flintoff has done the right thing by himself in rejecting the "ludicrous" England contract and taking the freelance option, the England board should pick him for matches only as long as he puts country ahead of any franchise or club. Speaking on his Cricinfo show Bowl at Boycs, he said the franchises' interest in Flintoff exists only because of his international success. 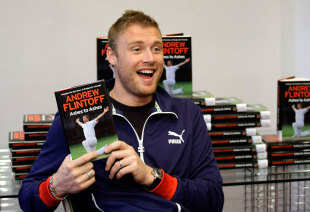 "The only reason people pay someone like Flintoff a lot of money to play in the IPL or for endorsements, is because he has played international cricket for his country, done very well, become a personality, an iconic figures, loved by many," he said. "So playing for the England international side has given him this opportunity to earn big money. "The choice is that he has to put his country first. Then he can go off and do whatever else as far as I am concerned. But he can't just pick and choose when he can play for his national side. And I think that should apply to all players throughout the world. You want to play for your national side, you want the kudos and the publicity that helps you with your endorsements - if you want all that then you can't jump in and out of international cricket; you have to be available first for your country." Flintoff has denied he will be picking the England games he wants to play and said he would be available for all limited-overs matches, fitness permitted. Boycott said higher appearance fees and bigger bonuses for winning international matches would prevent other players from taking the Flintoff route. "Now 25,000 pounds for Flintoff to sign an ECB contract is ludicrous. He can already earn one million pounds for six weeks of work in the IPL. He earns another million pounds from other sources. On top of that he's just had a book come out that has been serialised in the newspapers. "I would have always preferred higher appearance fees for the XI who have been selected to play and much bigger bonuses when you win. That concentrates your mind wonderfully. If there are 16 or 17 players in the squad it concentrates your mind in that you think that I need to perform and get into the top XI so that I can earn more money. And then concentrate your mind on winning - not just playing but winning - and then you get big bucks for that. Those are the only two things that I would focus on. It improves all the competition for places and makes the team better."